This recipe is so good and so easy! A long time ago I used to have Italian Night when I worked for the Utah Shakespearean Festival. One night some of the crew delivered 10 lbs. of ground beef and 10 lbs. Italian sausage and asked me to make as make meatballs as I could. I was up to the challenge and this is the recipe I created. Combine meats in a large bowl. Add eggs, garlic, cheese and spices; mix well. Add in breadcrumbs and mix again. Add water and mix a final time. The mixture will be a little gloppy from the water, but it will make the final product so tender! Form into balls. This will make 16 meatballs. (Less if you make them bigger.) 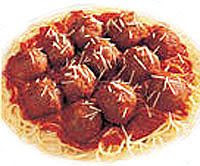 Spray a broiler pan with non-stick cooking spray and place meatballs. I use this type of pan so the grease drains. Bake at 350 for about 20 minutes. Your time may vary. You are looking for a nicely browned meatball. If you don’t put them in sauce, you need to make sure the internal temp comes up to 160 degrees before eating! Or…Drop meatballs in your sauce and cook an additional 15 minutes.